This Carriage Print of Tewkesbury is a view across the River Avon towards the fine Norman tower of St. Mary's church. 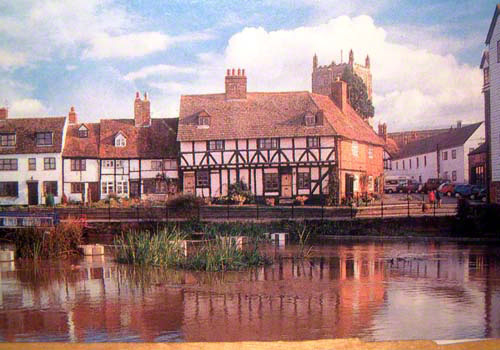 Claude Buckle manages to achieve a pleasing composition and captures the town's flavor of river, medieval timbered houses and Christian heritage. The view looks up Mill St and the mill is just visible on the right of the picture. Tewkesbury stands at the confluence of the River Severn and the River Avon, and also the minor tributaries Swilgate and Carrant Brook.